from the Fall/Winter 2015 issue of Reflections magazine. I have a confession to make. I have never in my life been able to do Centering Prayer. I’ve tried to do it many, many times. I quiet my mind. I find my sacred word. I sit. I try to be fully present. I try to let go. I strain. Sometimes I flat-out fall asleep. Eventually I stop trying and inevitably feel guilty that I cannot be the contemplative person I wish to be. The same thing happens when I try to walk a labyrinth, meditate, or use an icon as a focal image for reflection. I’ve simply never been able to connect in a meaningful way to any of these particular contemplative practices, no matter how many times I’ve tried. It’s not that I’m unable to maintain a posture of silence. Even though I tend to be a person of many words, dwelling in silence has never been uncomfortable for me. I always feel a bit guilty about admitting this to others. It’s as if I’m confessing a deep, dark secret that reveals a failing in my spiritual character. Perhaps people will wonder if my faith is really as deep as I say it is. It is especially difficult to share my feelings with friends whose lives have been changed by these very same contemplative practices. I am often asked to walk, sit or meditate with my community, and sometimes I do. Most of the time, however, I politely decline and then feel a familiar pang of guilt, as if I am somehow rejecting them or — even worse — God. I certainly do not wish to imply that someone else’s pathway to God isn’t good enough for me. But by the same token, I don’t want to feel that my own faith journey is somehow inadequate just because I can’t connect with God using the same pathways others do. 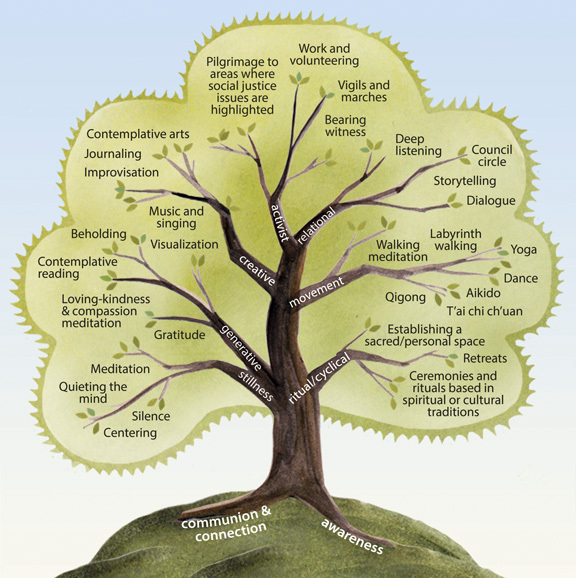 Not too long ago I stumbled upon an image called the “Tree of Contemplative Practices” at the website of Contemplative Mind in Society (see: http://www.contemplativemind.org/practices/tree). I had never seen anything like it. The basic idea of the image is this: all contemplative practices (and there are many!) 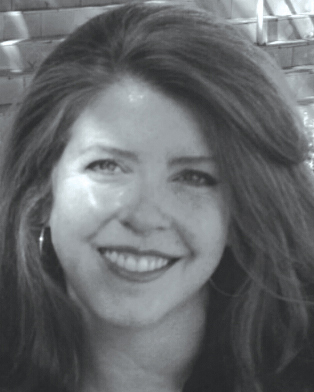 are rooted in two essential concepts: awareness and communion/ connection. These provide the foundation from which contemplative practices grow. And as a tree branches in different directions as it grows, different practices will spring from these roots. But they are all a part of the same tree. People who engage in some type — any type — of contemplative practice essentially seek the same two things: a deeper awareness, and a desire for a fuller communion with God, people, and the world in which we live. When looking closely at the image, one can see that the branches on the tree are incredibly diverse. This realization is what was so freeing for me. While there are, of course, the more familiar branches representing the practices of stillness (meditation, silence, centering, etc.) and movement (labyrinth walking, yoga, dancing, etc. ), it was a great joy to discover that there are other contemplative practices which involve creativity, ritual, relational interaction, activism, and approaches intended to generate thoughts and feelings rather than silence or emptiness. All of a sudden my love of music, pottery, weaving (and even coloring!) were elevated to a new level. I had always known they drew me closer to God, but it had never occurred to me to consider them acts of contemplative practice. My love of mission, theological reflection, volunteerism, gardening, and many other things also became more meaningful. The metaphor of the tree gave me a whole new perspective on the actions (and inactions) of my life. What is important, then, is that I engage the activities of my life with intention. Intentionality is what transforms simple activities into contemplative practices. When I am intentional, I find myself developing a deeper awareness and sense of connectedness. They’re not vacuous exercises. They are opportunities to participate in the transcendent, and they become avenues for healing, maturation, rest, peacefulness, freedom from guilt and so much more. This is the life of abundance to which we are all called. Amen, amen, amen. Contemplative Mind in Society offers a free download of a blank Tree that you can customize to include your own practices. What are you already doing that slows you down and brings you into the presence of God? Daily walks? Gardening? Personal retreats? What activities might you take on that foster your awareness of God’s presence in your life and lead you to connection with God and others?